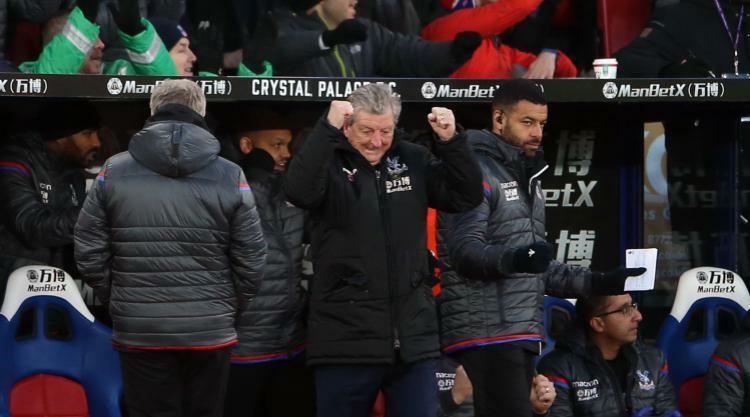 Roy Hodgson insists Crystal Palace's relegation fears are far from over despite their dramatic 2-1 victory over Watford finally lifting them out of the Premier League's bottom three. An 89th-minute goal from Bakary Sako was followed by fellow substitute James McArthur's winner three minutes later, securing the remarkable recovery that had begun with Tom Cleverley's red card. Watford had taken the lead when Daryl Janmaat headed in unchallenged from Richarlison's third-minute cross, but Palace again demonstrated the resilience Hodgson has given them to secure points late on. The manager was appointed after predecessor Frank de Boer was sacked having overseen four defeats from four, amid a run of seven consecutive league losses from the opening game of the season. Palace also did not score until their eighth fixture, but they are unbeaten in their last six, having also recently secured a late victory over Stoke. The 70-year-old Hodgson said: "There's a long way to go. For a good period going forward, we're going to be in or around that relegation zone. One week we'll be in it, another we'll be out of it. "I'll just keep pushing my message, not just to the fans but the players that each game is an opportunity, a potential banana skin or the opposite. If we can at least continue to show the fight, it would be disappointing to find ourselves in the (relegation) zone and not fighting as hard as we are. "Watford were the better team, but they are a good team. They've had a very good start to the season, and some very good results away. We weren't anywhere near as good as we'd like to be, but I'd give Watford credit for that. "When you say, 'No one gave us a chance', we didn't feel this was a hopeless case." While Marco Silva's Watford remain ninth, his team have lost six of their last nine games at a time when he refused to rule himself out of becoming Everton's new manager. Silva insisted his team deserved to win, and refused to blame Cleverley despite the influence of his 87th-minute dismissal. "We should have won," said the Portuguese. "When you play like we did for 85 minutes - we were leading 1-0 but we must score more. "The red card changed it. It gave them belief. We should not have left (Wilfried) Zaha cut inside. We'd been two against one on him all night. We should have managed the match in a different way in that moment. "Angry? No. Cleverley deserves all the credit. What he's done up to now has been amazing. He's a big example for everyone in our dressing room."